Once again a year has passed and for the 4th time we have a German Transformers Fan Convention near Moenchengladbach. This time we were in Nettetal near the Dutch border. The House Seerose was our host this year and to get this off my chest right at the get-go: they were great hosts. Great location, very nice food, and extremely friendly and helpful people, especially compared to last year. •	Weather: 2011 – Perpetual rain / 2012 – Sunshine and 22 degrees Celsius. I think the bullet points speak for themselves, the Charmed Third was easily squashed by the Fantastic Fourth. That’s not saying that last year’s convention was bad, far from it, but this year it was just so much better and we’ve really raised the bar once again for next year’s event. This is gonna get really hard. Same procedure as every year, I arrived on the day before the event and after a short check-in at my hotel (Gasthaus Luethemuehle, a very pretty and fully recommended hotel) I was off to House Seerose. My timing couldn’t have been better, because by the time I arrived all the heavy lifting was done, all the tables were in position, 2 out of 3 special guests had already arrived, and there were enough guys with nothing much to do so they could help me carry in my stuff for the joint Transformers-Universe / Lilly & Friends booth. I couldn’t have timed it better if I’d tried. Speaking of special guests, Simon Furman was there for the second year in a row and in a good mood as always. And he had brought his long-time and current collaborator Andrew Wildman, with whom he’s currently working on Transformers ReGeneration One, the continuation of the old Marvel Comics Transformers series. Later that day they were joined by the only German comic artist involved with Transformers so far, Klaus Scherwinski. Strangely enough the strong similarity between Klaus’ and my own last name didn’t lead to any shenanigans. Too bad, would probably have made a good few anecdotes, but you can’t have everything. After putting up the booth and various preparation tasks we headed over to the restaurant of House Seerose for a very nice dinner. Despite the fact that three different languages were spoken at the tables (German, English, and Dutch) the waitress easily retained every order and we all ended up sated and happy. Once again, big compliment to the staff of House Seerose. As usual a lot of jokes were made, a lot of shop talk went down. Among other things we learned that, ever since being involved in Spotlight: Wheelie, Klaus Scherwinski is a big fan of the Wheelie character (well, there had to be at least one) and we also laid the ground work for an IDW Spotlight featuring Wreck-Gar & the Junkions. Let me add this, though: if it does happen and the Junkions speak Spam in the IDW comics, I expect to be mentioned in the credits if they reference the LOLCats. One too-short sleep later it was morning and we headed back to the location, where we arrived shortly before seven, just in time for the first dealers to arrive and set up their tables. As usual the members of the C.O.N.S. organizing team used the chance to check out the merchandise while the room was still empty and got away with a few good bargains in the process. There have to be some perks to doing all that work, after all. Old acquaintances were greeted, last-minute preparations were made, a thousand little things involved with an event like that were done. Technology failed us here and there (twittering ain’t easy, presentations should always be backed-up, etc. ), but shortly before 11am everything was ready and we opened the doors to the public. A Day at the C.O.N.S. As I mentioned above I got most of my own shopping done before the event officially started and that was most definitely a good thing. In my double role as dealer and moderator on stage I spent most of the day running around, which also meant that some parts of the program escaped me completely, I’m afraid. It got better in the afternoon once my beloved wife Dani arrived. She couldn’t make it earlier due to us having two sick birds at home who required her care, but that just meant I was that much happier to spend the rest of the day with her. Many thanks to Marvel aka Sideways, btw, who kept watch over our booth whenever I had to make a run for the stage. Many parts of the day’s program were, of course, similar to the previous years. We had interviews with our guests, we had a raffle (divided into two separate ones this year) where stuff was handed out to lucky winners (with a lot fewer Bumblebees involved this year, though there were at least a dozen Hunt for the Decepticons Backfires, I believe), and our numerous contests were held. On a very positive note: the number of participants in our contests had increased drastically when compared to previous years. We had new stuff, too, of course. Simon Furman went to the trouble of writing a play exclusively for our event, which we performed live and unrehearsed on stage. And while the English language skills of the participants were all over the place and more than one cue was missed, it was still a lot of fun and might just become a tradition at future events. We’ll see. First and foremost, though, it was fun. Thanks once again to Simon for writing it and thanks to all the participating team members and guests as well. If there was one slightly negative thing worth mentioning at the C.O.N.S., then it was the apparently less than stellar interest of the visitors in everything not directly related to the purchase of Transformers figures. But who among us can blame them if the little toy robots themselves were the major focus of their visit? Let’s see, we might just be able to ignite the general German fan’s interest in the peripheral Transformers stuff as well one of these days. We’ll keep trying. On a very positive note, on the other hand, I was once again pleasantly surprised by the extreme diversity of the visitors. Apart from the classic fan boys and girls we had families with small children, men and women of all ages and skin colours, everything was there. Conversations were held in German, English, Dutch and wild mixtures of the three. I got to meet several people I only knew online by their nicknames so far, but now I can put faces to the people behind the avatars as well. Just plain fun. And before you knew it, we were approaching the end zone again. By 5:30pm the dealers started packing up to the sounds of the band Rampage. A final raffle round was held before it was time to say goodbye. Before that happened, though, the grand price of the C.O.N.S. raffle had to be given out, of course. 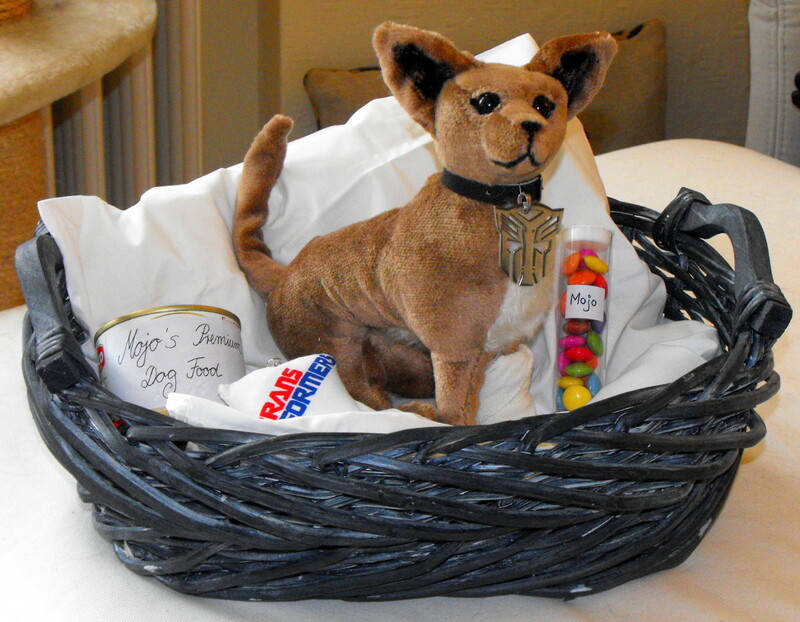 My wife Dani had specially made “Mojo” for the raffle, including a dog basket, dog food, little cast for his leg and pain killers (aka Smarties). The lucky winner, whom I did not know by name (sorry), took the very life-like replica of the little dog we saw in the first Transformers movie with him. According to hearsay his wife would be very happy with it. Maybe the winner in question will read this and send in a picture of Mojo in his new home. I’d very much appreciate it. And then it was time to pack up and go home. Of course a lot of goodbyes and thank yous had to be done first. The obligatory team picture with the special guests had to be taken. And to once again cite Joe Cocker’s evergreen: “I get by with just a little help from my friends”. Because for an event that was organized by a wild bunch of “mere” fans in their spare time, this fourth C.O.N.S. was certainly something to be proud of. Well, that’s pretty much it for me. The final attendance numbers for the 2012 C.O.N.S. haven’t been tallied yet, but I have a definite feeling that they will easily surpass those of last year. And we’ve already made arrangements for 2013. We will be in House Seerose once again and many of our dealers have already booked their tables as well. So bottom line: a great day. And while some minor things might not have been fully perfect just yet, that’s just fine with me. After all, you have to have stuff to do better next time, right? So see you all at C.O.N.S. number five! PS: More news right from the source: we had 29 dealers and 487 visitors at this year's C.O.N.S., which means we haven't only broken our own attendance record from last year, we'be also shattered the European attendance record for a (single-day) Transformers Fan Convention (previously held by the Auto Assembly). Congratulations everyone!